Last weekend my husband took me to see Rain, a Beatles tribute band. I thought something a bit psychedelic was in order, so I wore my Free People sweater coat. It’s an old favorite … seen in this Feb 2014 post. My husband got into the spirit and wore this rainbow Robert Graham shirt. Doesn’t he look handsome? The show was great and we had a blast! 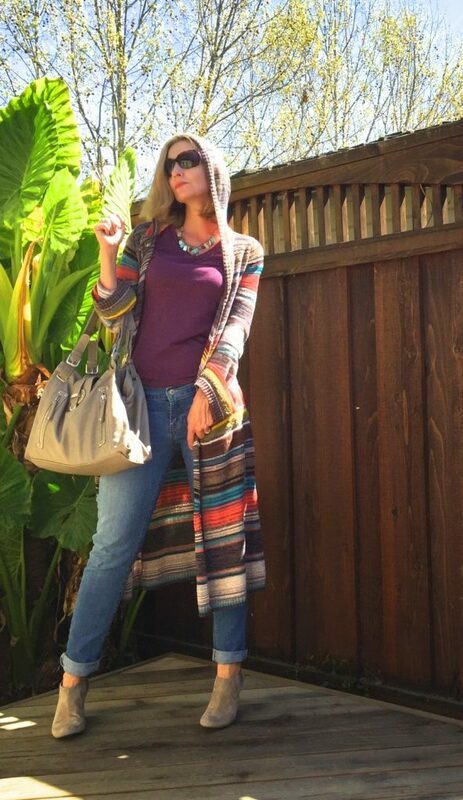 Wouldn’t Rebecca of Red Tag Chic Los Angeles fit right in with our boho vibe? Loving this Stevie Nicks inspired ensemble she shared with us last week! And I’m positive Steve Nicks would also approve of this magical look from Andrea of Boho Bunnie! How lovely is Annette of Lady of Style in this pretty blue tunic? And Glenda of So What to Twenty is looking like walking sunshine in this beautiful yellow dress! Thanks so much everyone for linking up last week! I’m so happy to say that Fun Fashion Friday is growing every week! Have fun linking up, please link back, and be sure to visit and comment on some other blogs so we can all feel the LOVE! Linking up: Passion for Fashion! Look What I Got! Mix It Friday! Turning Heads Tuesday! A Beatles tribute band sounds SO fun!! Your sweater coat was the perfect choice to be cute, comfortable, and fit right in with the vibe of the show! How fun! I love your outfit, ,it's perfect! Literally drooling over the sweater. I love it and I want one! So 70s…so boho…and so California. Have a wonderful weekend. I LOVE tribute bands! And you and the hubs look fantastic! Sounds like a fun night out! We saw a Beatles tribute band a few years ago and they were incredible. Love your cardigan! Perfect look for your fun evening out! I have a long sweater cardigan very similar to this and it is just the coziest thing ever. Wow thanks soooooo much for the feature – and so honored to be in sync with your boho inspired theme! Have a fab weekend ahead sweetie!! LOVE this look, Rebecca! Muah! I just love your cardi!!! Have a great Easter. How fun! I love seeing any live music! Your long cardigan is fabulous! Love the stripes! You look amazing! I had a feeling that was a Free People cardigan. It's gorgeous and I really love the duster length. I really love the Beatles, sounds like a fun night. 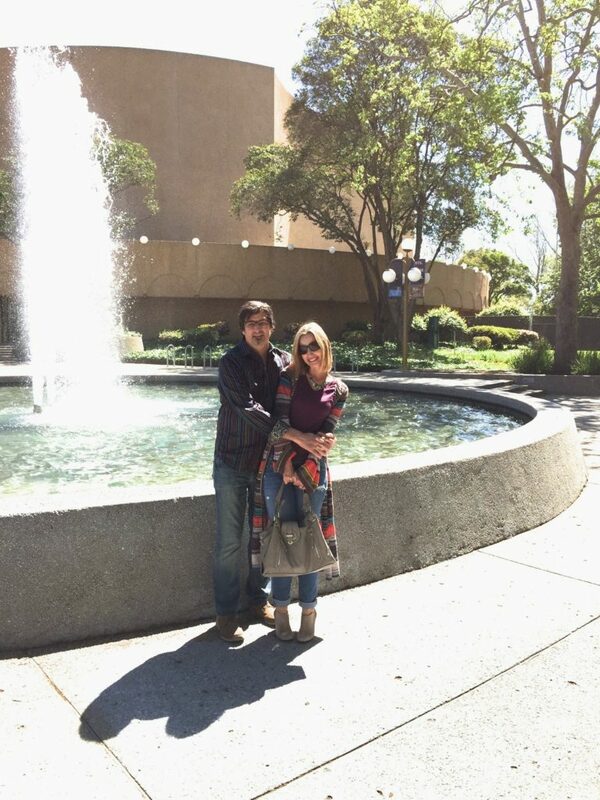 Your husband and you are too cute (and quite a good looking couple!). Love a live band! Stop by my Wednesday Link Up (still live) if you get a chance. Aww thanks so much, Tina! Muah! Obsessed with your sweater coat!! How perfect is that for a Beatles concert?! This is such a beautiful coat! You and your husband look simply gorgeous, what a lovely couple you are! Love your necklace too, wish I could see it close up. Have a lovely Easter Dawn. Thanks for hosting. Like your outfit! It's too cold here to wear summery Boho – stuff. I find it a hard style to wear in general but like it lost on others. Love the sweater….the entire outfit is perfect! Have a fabulous weekend my friend! Thanks, Debbie! You have a fab weekend too! Are you on spring break? How perfect for the concert! Hope you had fun! Love the casual look Dawn! I am a huge lover of long, duster length sweaters like yours. It makes for a great look. Thank you for hosting your Fab link up! I love that fun, long cardi! The color of your top is so pretty too! Have a great weekend! I should've gotten a close up of the necklace, right? And yeah, Shannon (hubby) was a good sport to coordinate with me! Muah! Love that long sweater look. What a gorgeous sweater, I adore it! You look gorgeous. I really adore that cardigan…or is it a coat? cardi-coat? Anyway…it's gorgeous. Joining the 40+ link up first time too. That sounds like a blast! You guys do alot of what we like to do. I would have been rockin and rollin 🙂 Love the free people jacket, you look amazing in long jackets. Love it with the purple and you know you look great in jeans. long jegs!! We could've rock-n-rolled together, Jess! Muah! Love the sweater coat! I have a few Free People pieces and they certainly know what the free spirit is. 😉 Those four ladies you highlighted in this post are stunning! Some of the pictures can be put on an magazine cover. 😉 Thank you so much for hosting this link up for us and have a great holiday weekend! Fabulous long cardigan, Dawn Lucy, the colours are lovely! Thanky you so much for featuring me amongst these fabulous ladies! Joseph had his technicolour dream coat and you have your oh so fabulous festive rainbow piece! !